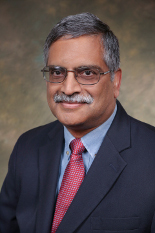 Dr. Srinivas Garimella is the Hightower Chair in Engineering and a Professor in the Woodruff School of Mechanical Engineering at the Georgia Institute of Technology. He is director of the Sustainable Thermal Systems Laboratory, which he founded upon his arrival at Georgia Tech in 2003. Dr. Garimella received a Ph.D. degree (1990) and an M. S. degree in Nuclear Engineering from The Ohio State University. He received a B. Tech. in Mechanical Engineering from The Indian Institute of Technology, Kanpur (India) in 1982. He was a Research Scientist at Battelle Memorial Institute in Columbus, OH from 1984-1990, and a Senior Engineer in the Delphi Harrison Thermal Systems Division of General Motors Corporation in Lockport, NY from 1990-1993. After serving as a Research Specialist in the Mechanical Engineering Department at The Ohio State University from 1993-1994, he joined Western Michigan University, where he served on the faculty of the Mechanical and Aeronautical Engineering Department from 1994-1998. Dr. Garimella was an associate professor of mechanical engineering and director of the Advanced Thermal Systems Laboratory at the Iowa State University prior to joining Georgia Tech. Dr. Garimella has mentored over 75 postdoctoral researchers, research engineers and students pursuing their M.S. and Ph.D. degrees, with his research resulting in over 250 archival journal and conference publications, a textbook on Heat Transfer and Fluid Flow in Minichannels and Microchannels (2nd Ed., Elsevier 2014), and a book on Condensation Heat Transfer (World Scientific Publishing, 2015). He has been awarded eight patents. He is a Fellow of the American Society of Mechanical Engineers, past Associate Editor of the ASME Journal of Heat Transfer, and Editor of the International Journal of Air-Conditioning and Refrigeration. He has also served as Associate Editor of the ASME Journal of Energy Resources Technology, and Past Chair of the Advanced Energy Systems Division of ASME. He was an Associate Editor of the ASHRAE HVAC&R Research Journal and Chair of the ASHRAE Technical Committee on Absorption and Heat Operated Machines, and was on the ASHRAE Research Administration Committee. He is a corresponding member of the ASHRAE Technical Committee on Heat Transfer and Fluid Flow. He held the William and Virginia Binger Associate Professorship of Mechanical Engineering at ISU from 1999-2001. He is the recipient of the NSF CAREER Award (1999), the ASHRAE New Investigator Award (1998), the SAE Ralph E. Teetor Educational Award for Engineering Educators (1998), and was the Iowa State University Miller Faculty Fellow (1999-2000) and Woodruff Faculty Fellow (2003-2008) at Georgia Tech. He received the ASME Award for Outstanding Research Contributions in the Field of Two-Phase Flow and Condensation in Microchannels (2012). He also received the Thomas French Distinguished Educator Achievement Award (2008) from The Ohio State University, and the Zeigler Outstanding Educator Award (2012) at Georgia Tech. His research has been funded by government agencies and industry, including the National Science Foundation, US DOE, ARPA-E, US Navy, US Army, Office of Naval Research, Nuclear Energy University Programs, Sandia National Laboratory, Oak Ridge National Laboratory, Georgia Research Alliance, ASHRAE, AHRI, Electric Power Research Institute, Iowa Energy Center, Exxon Mobil, Shell Global Solutions, General Motors Corporation, Modine Manufacturing Company, John Deere, United Technologies, Rockwell Collins, ALCOA, Heat Transfer Research, Inc., Atlanta Gas Light Resources, BAE Systems Science and Technology, Cargill, and LG Electronics.